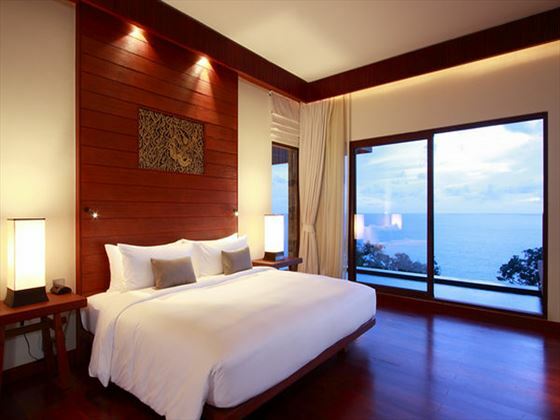 A luxury resort located on the shores of Kamala, Phuket, known as ‘Millionnaire’s Mile’, Paresa occupies one of the most breathtaking locations on the island. Perched high on the clifftop, surrounded by tropical forests, bathed in spectacular sunlight and flanked by the blue waters of the Andaman Sea , Paresa’s unique architecture and elegant interiors complement the natural surroundings. All guest Suites or Villas face the sea, and most offer private infinity pools from which to enjoy mesmerising seascapes. Paresa boasts a total of 49 luxurious and elegantly furnished guest suites and villas, all of which face and have uninterrupted views of the Andaman Sea. 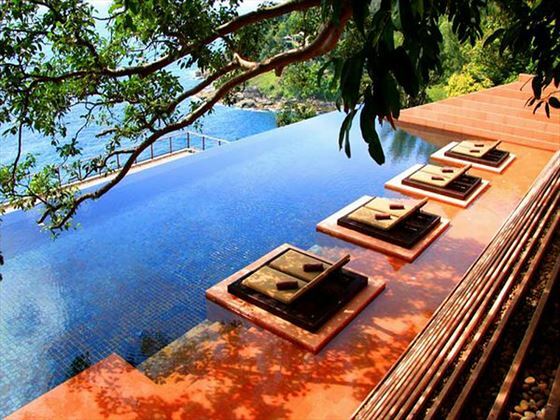 Most rooms also offer private infinity pools. 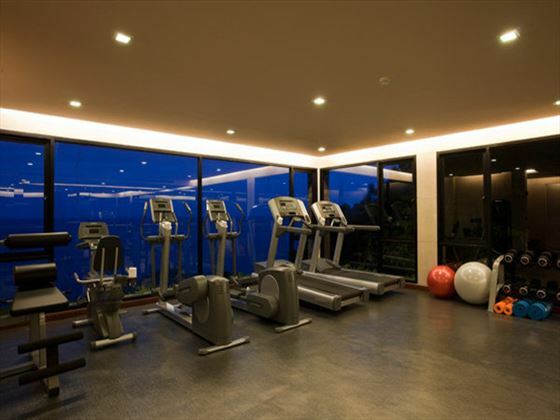 All feature LCD Televisions, DVD Players, IPods’ with sound stations and espresso machines. 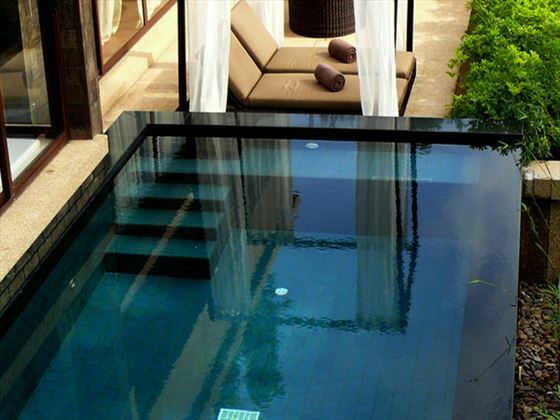 13 Talay Suites (120 m²), with joint access to an overflowing infinity pool and spacious outdoor balconies. Ideal as an interconnecting suite and all featuring King beds, daybeds and spacious bathrooms with showers and baths. 18 Aqua Suites (140 m²), boasting private infinity plunge pools with indoor and outdoor showers, large balconies with sun loungers and dining table to relax outdoors. King beds with luxury linens and daybeds to sink into provide a welcoming indoor living space. 5 Dima Spa Suites (210 m²) are pure sensual indulgence, each features private infinity pool; steam room; island bathroom; and spa treatments are provided in the suites private outdoor treatment sala, in addition to the bedroom and living spaces. 7 Cliff Villas (160 m²), completed with adjacent living sala on the ocean front; large private cantilevered infinity pool; indoor and outdoor bathrooms; and a well-stocked wine cellar. Sensual outdoor living. 6 Cielo Residences (660 m²) are the ultimate in luxury living, with large private infinity pool; private living and dining pavilion; spacious verandah; indoor and outdoor bathrooms; fully equipped kitchen with wine cellar; and personal butler available. All rooms feature: super king size beds dressed in white linen and topped with feather pillows and duvets; private verandah with daybed and/or sun loungers; WiFi internet access; In Villa Bar; espresso machine; LCD TV; DVD player; and iPod and sound station. For guests travelling in larger groups, or with families, the Grand Villas present an ideal setting. 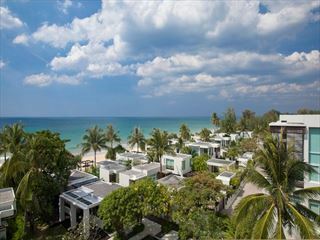 Five Grand Villas type 1 (1,300 m²), each comprises a Cielo Residence on the upper level; two Talay Suites on the middle level; one Dima Spa Suite on the lower level; and three swimming pools. 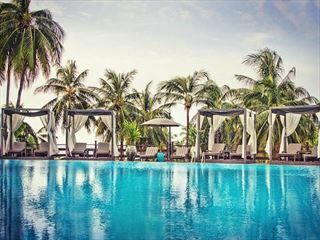 One further Grand Villa type 2 (1,150 m²) comprises a Cielo Residence on the upper level; two Talay Suites and a Junior Talay Room on the lower level; plus two swimming pools. Each Grand Villa can accommodate 8-12 adults. 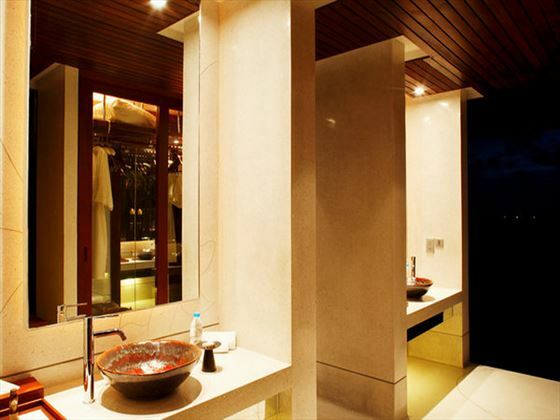 There is a wonderful 5 room Spa, offering the very best in pampering. A gym and 2 wonderful freeform pools (in addition to your own) await. Views and chill out is definately on the menu and all the activities you could think of are everywhere around you on this big island. This is a peaceful haven, an intimate yet spacious Resort with views to die for. You can do as little or as much as you like at the Paresa Resort and the beach is short stroll down the hill (the resort will drop you off if you wish). No kids clubs or anything like that but if you like to have a close family holiday, where you have your own pool in a fabulous resort then you will enjoy this Paresa. With the beach not immediately in front of you, the resort does not attract many families with younger children. Paresa’s culinary outlets cater for all tastes and serve mouth-watering dishes using only the freshest ingredients. 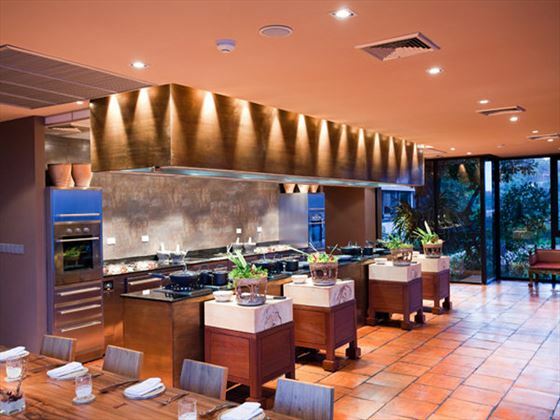 Diavolo is the resort’s main restaurant, serving generous à la carte breakfasts followed by Italian or Mediterranean delicacies at lunch and dinner. Guests can enjoy a spectacular 270° view of the ocean; sample some of the finest wines from around the globe in our glass wine cellar; and enjoy signature cocktails or fresh juices at the bar. Talung Thai, Paresa’s signature restaurant, serves authentic Thai cuisine in a modern setting and offers a menu of the most popular dishes from around the Kingdom. High on the cliff top, this al fresco restaurant is shaded by the canopies of majestic Banyan trees and offers the perfect venue from which to enjoy magnificent sunsets. Paresa also offers private dining for up to 12 guests in Recipe, an intimate venue with 270° ocean views that serves a customised menu. 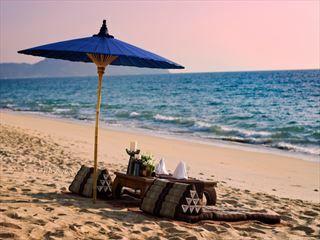 Recipe also hosts daily traditional Thai cookery classes led by the resort’s Master Chef, using state-of-the-art cooking stations. At Recipe guests can create their own dinner party, with the help of the chefs and staff. Infinity Experience is the ultimate in alfresco dining. On private islands in the shallow waters of the fiber optic lit infinity pool, guests can dine under the stars, accompanied by the sound of the waves and the warm ocean breeze.